On Monday we moved from the beautiful Sunset Harbour Yacht Club in Miami Beach to another beautiful marina called The Suntex Marina at Hollywood Florida. The ride was a very short 10 miles and we were now in the truly defined Atlantic ICW (Intracoastal Waterway) with plenty of water depth. The ride was a very carefree voyage, we had 4 bridges to negotiate, but had to wait for only 1 of them, a 16ft drawbridge. The trip into & thru Hollywood had a lot to offer for scenic viewing of homes, resorts, etc. The waterway reminded me of Venice Italy, with the water coming right up to the doorsteps of some of the homes. We arrived at The Suntex Marina at Hollywood about 11:30am on Monday. The place is again a very pretty environment, but with less big boats than Miami. The marina & resort are on a big complex, I am not sure if Suntex owns it all or simply shares privileges with the condo association. The marina is separated from the Clubhouse & Pool by about a half mile of driving thru swank winding roads among the condos & palm trees. We ended up having to rent a car for the week to get to the pool and Hollywood Beach. Monday night me & Jonell took a short walk down the Hollywood Beach Broadwalk and had dinner at a sports bar called Nicks on the Atlantic ocean. Yes, it is called the “Broadwalk” not Boardwalk, and is a very wide 2.2 mile long paver brick path along the Atlantic coast of Hollywood. After dinner on the Broadwalk, we retired early prepping for more visitors arriving on Tuesday. Tuesday morning we spent most of the day cleaning the boat prepping for guests. Our Metro Detroit guests, Chris & Susan arrived about 4pm, they will stay with us for the next week. We have known Chris for about 22 years and Jonell has known Chris’ friend Susan for about 12 years. Our Hollywood Florida guests Cindy & Dawn arrived about 5pm, they only stayed for a dinner visit. Cindy & Dawn are Jonell’s cousins. Cindy lives full time in our current port of Hollywood Florida and Dawn splits time between Michigan & Florida. We had a few rounds of drinks on the aft deck of Gettin’ Looped, took some arrival photos, and prepped for dinner. After a few rounds of drinks, we went to dinner at a place called The Yard House. It was located inland about 3-4 miles away, inside a large commercial area called The Village at Gulfstream Park. The Village had many restaurants, shops, fountains, and even a casino for Nellie (Yikes, there goes the monthly budget). It was a long, fun , first day ! On Wednesday, we started the day slowly by simply getting our bearings around Hollywood. In the morning I went to Enterprise to pick up a rental car for the week. We drove the rental car up to check out the pool, we did not go swimming, we just wanted to check the place out. We also went checking out restaurants/bars to get our bearings on which places we liked the best for dinners later in the week. About 1pm, one of my bosses from Fiat Chrysler named Joe Grace arrived with wife Francine. Joe & Francine were in Florida for the week, doing the whirlwind tour. They started in Ft Myers, went to Naples, Islamorada, visited us in Hollywood, and then were planning to head up to Boca Raton to see Joe’s aunt (whew, pretty hectic pace for a vacation). Some of you readers may recall that this was our 2nd Looping visit by Francine. We had seen her last month in Marathon Florida where she met us & other Loopers for dinner at The Sunset Grill on Marathon Island. Francine was vacationing with her friend in Florida last month (boy is she lucky, I wish I could be in Florida for a month, oh-yea I am). Joe & Francine were on a tight time schedule, and simply popped in for a few drinks and catching up with Jonell & I, talking about our Great Loop Adventure. 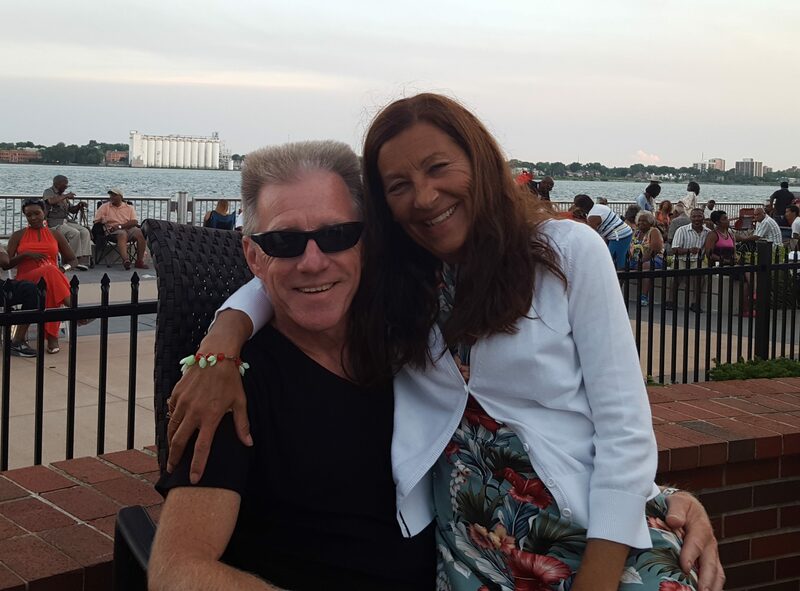 Joe & Francine are also our boater pals from Lake St Clair, they keep their boat at Emerald City Marina, two marinas over from our Miller Marina home port. After Joe & Francine left about 5pm, we headed over to the Atlantic coastline and had dinner at The Landshark Restaurant on the Margaritaville Resort Property. After dinner we walked the Broadwalk, had some ice cream, and listened to some musicians. Thursday morning I worked on the our 2017 federal income taxes. I have a person in Michigan that prepares the tax filings, I like to have someone else’s stamp on the tax return. So my task for the day was simply to collect & organize all of my documents, put them into an electronic format, and send them off to my tax preparer Terry Scheuster (W2’s, Brokerage Statements, Taxes Paid, Interest Paid). I will have a conference call with her next week to prepare the tax return. About noon we filled up the cooler, got into swim attire, and headed out for “Pool Day”. As mentioned earlier, the pool is about a half mile away from the marina, The Pool & Fitness Center are shared between the marina and all the surrounding condo owners. We have been there twice and it is typically empty. The day was a little windy, but the wind was lowered near the pool by all the surrounding trees. It was a great afternoon. We left the pool about 4pm, cleaned up a bit, and headed out to an early happy hour drinks/dinner at a place called 5 O’Clock Somewhere. It is an outdoor Tiki-Bar kind of place on the Atlantic ICW. We hung out at the bar with bartender JC, and then watched a very good band as the girls danced well into the night. On Friday we started the day with a trip to The Historic Hollywood Downtown, located inland about 2-3 miles west of the Atlantic ICW. It was the normal quaint downtown area with shops, restaurants, and pubs. We walked the downtown streets a bit, and then had a mid-morning brunch at Mickey Byrne’s Irish Pub. We returned to the boat about mid-day, and proceeded to unload the dinghy and go on a little ICW exploration trip. We ended up at a place called LeTub, a strange place right on the water with a jungle theme, lots of nautical decorations, and a lots of toilets ? 10 Best Magazine says “One of the most unusual hamburger joints around. Known for being a favorite of Oprah, Set along the Intracoastal Waterway in a former garage, guests sit among a number of old bathroom fixtures that are scattered around and surrounded by flowers and plants. Take in the beautiful views of the river and the parade of boats that go by and know that when the food arrives it will be memorable“. Still not sure what all the toilets are about ! After lunch we took a slow ride back to the boat, went up/down a few canals doing some water side real estate reviews. After returning to the boat, we washed off the dinghy, reloaded the dinghy back onto Gettin’ Looped, and got cleaned up for dinner. Dinner turned out to not really be desired due to the late lunch. The Suntex Marina & Condo Association was having a little Happy Hour Friday night marina party with locals & transients invited. Chris & Susan decided to take the challenge of meeting some new folks, Mike & Nellie crashed watchin TV on the boat. It sounded like the girls had fun, met one guy who talked too much, had a few drinks with the locals, then came back to the boat. The night ended with a few episodes of Cheers on Netflicks. Another fun/active day in the books. The day started with breakfast at a place called Grampa’s Bakery & Restaurant. It was a wonderful start to the day. All the food was advertised as “home-made”. Every table was treated to a free plate of mixed flavor Danish, and the breakfast sandwiches we had were very good. Grampa’s was also featured on the Guy Fieri’s – Diner’s, Drive-in’s, & Dives ! After breakfast at Grampa’s, we went to the hardware store for some supplies, we went to The Men’s Warehouse for me to get measured for a Tuxedo for Daniel’s wedding coming this September, and then we returned to the boat. The weather on Saturday was overcast with threats of rain all day, so the girls spent the afternoon at The Seminole Hard Rock Casino. As of the writing of this blog, I understand via texts that we have No Winners (what a shock! ), but it sounds like the girls had $300 worth of fun ???? > Mrs Murph lost her first $100, and decided to take out another $100 from the ATM. > She said that she entered a $100 withdrawal, magically the silly ATM spit out $1000. > Needless to say, there will be an $800 deposit back into PNC bank tomorrow. After the casino extravaganza, we went to dinner at another place in the Gulfstream Mall Complex, called Frankey’s Sports Bar. It was a classy type of sports bar, predominated by horse racing. They have everything from steaks to seafood, but are known for their “Grass Fed / Grass Finished Angus Beef”. I had the burger, gave it an 8 of 10 on the Murph scale of culinary treats (it was not sweet like a dessert). While en-route to Frankey’s, I received a call from a guy named Frank, 3 boats down from us at the marina. We had casually met Frank & Chris Blackstone in the marina on the dock. They are from New York City, and spend 6 months in NYC & 6 months in Hollywood every year. They have boats in both ports. I had given them one of our boat cards, and Frank called Saturday night to invite us over for drinks on their boat, with their friends Joe & Debbie, also from NYC. Joe & Debbie also have boats in NYC & Hollywood Florida. It was yet another wonderful meeting of new friends that we continue to make in every port. Frank was very insistent that we call him for the New York City tour when we get that far north. I have made a note in my calendar to do that. It was another very fun night, with new friends ! On Sunday I woke up about 7:30am, had my casual coffee, and prepped for the return of the rental car at 9am when Enterprise opened. About 8:45am, Jonell woke up and asked “did you return the rental car already”. I responded “no, they don’t open until 9am”. She replied “It’s 10am Mike”. In spite of the 1 hour delay due to daylight savings, the return of the rental car went off without issue or additional cost. Also Sunday morning, the marina staff had a Waffles Breakfast Party. Susan & Chris took advantage of the breakfast treat, Mike worked on the blog, and Nellie had coffee on the back deck. Sounds like the waffles, supplied by Chef Jim, were Yummy. On Sunday afternoon we took the Uber to downtown Hollywood for the one week early St Patricks Day Parade. It was about a 2 hour parade highlighted by lots of bagpipes, The Budweiser Clydesdales, and an awesome St Patricks Day Dog. After the parade, we went for lunch at a place called Patty Macs, a shop which featured about 6 different types of Mac/Cheese, and a large menu of fresh squeezed juices, flatbreads, and sandwiches. The afternoon ended with Mike returning to the boat to watch the Valspar Championship Golf Tournament, watch the Monster Energy Nascar Race, & finish the blog. The girls went back to the Hollywood Broadwalk, for one last walk before departing Hollywood tomorrow. It was a great week in Hollywood Florida. Next Stop = The Bahia Mar Yachting Center in Fort Lauderdale Florida. You now how to “lead the good life” Mike. very impressive. Susan and I had SO MUCH FUN with Mike and Nellie… perfect weather, perfect hosts, and met new friends at every turn of our adventures…We love you and Thanks so much for all your attentiveness, laughs and makin us smile everyday!! Thx Chris, we had fun too !